CTD can ship any cargo trailers of any size. Cargo trailers are very useful. They allow to carry heavy tools and supplies, They are often used by businesses. Building materials and plumbing supplies, antiques and pieces of art – cargo trailers can safely move it all. And CTD can do the same with any cargo trailer! 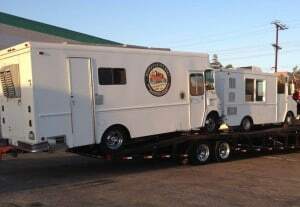 Just give us the details about your trailer and we will transport it for you anywhere in the US. Our Trailer Transport is also available for trailer homes. Trailer home is used like a mobile house to live in. It’s built in a way they can be easily transported. And if you don’t want to drive hauling your mobile house behind you, CTD can help you with Trailer Transport. For example, you’re a snowbird and your trailer home is where you live while in the warm states. It’s a nice small house and you don’t actually have to move it yourself. We will move your trailer home for you safely and promptly. CTD knows how to handle Trailer Transport right! CTD can move a solar trailer as well. Solar trailers provide remote power backup. They are often used on building sites. This way contractors can use these trailers’ energy for their radios and lights. These trailers are very quiet. They even can be used during the night and won’t disturb anybody. People also use solar trailers when they go camping or at outside weddings and barbecues. So it’s a really useful thing and can be transported anywhere. And CTD will be happy to move your solar trailer for you! We are one of the leaders in Auto Shipping. CTD knows it all about Vehicle Transport and is looking forward to helping you! We can also help you with many other services, such as Truck Transport, Boat Shipping, etc. Whatever the reason you need Trailer Transport services, CTD will gladly provide them for you. Give CTD today to discuss your Trailer Transport and get the best quote in the market!